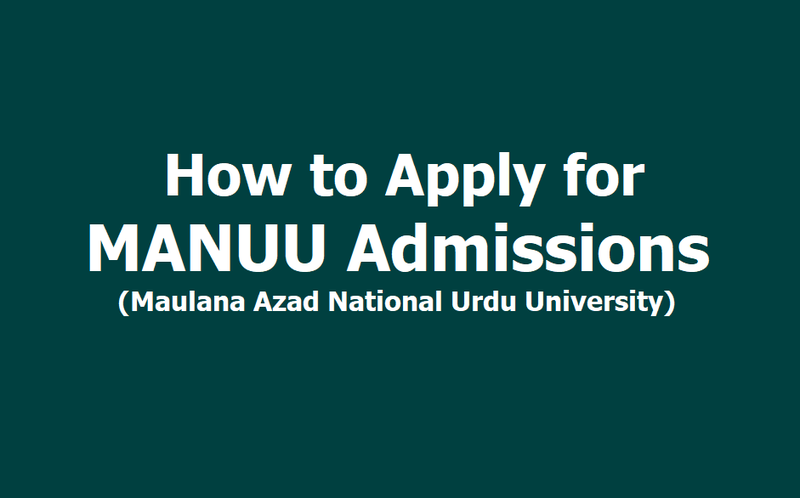 How to Apply for MANUU Degree, PG, Doctoral Programs and other Courses Admissions 2019: Maulana Azad National Urdu University, MANUU, Gachibowli, Hyderabad is inviting online applications for admission to undergraduate, postgraduate and PhD programs. The programs include Ph.D, Post-Graduate, Undergraduate and Diploma/Certificate. University is offering these programs at its Hyderabad Main Campus and Satellite Campuses, Colleges of Teacher’s Education (CTE) and Polytechnics for the academic Year 2019-2020. Interested candidates can check admission related details on the official website of the University manuu.edu.in. Candidates can ask for further details or any clarification by sending an email to admissionsregular@manuu.edu.in.Only online applications will be accepted for admission. The e-prospectus and online application forms are available on the official website of University from March 25, 2019. Applicants should note that they must have passed Urdu as a subject/language/medium at least 10th/ 10+2 / Graduation level or from the list of Madarsa which is available in the e-prospectus. All the programs at the University are offered in the Urdu language. They should also note that admissions for all programs are offered at MANUU Campus, Hyderabad unless mentioned at other campus or college. Admission for programs will be either through Entrance Test or Merit. Here is a list of programs for which admission will be through entrance test and merit. PhD Programmes: Urdu, English, Hindi, Arabic, Persian, Translation Studies, Women Studies, Public Administration, Political science, Social Work, Islamic Studies, History, Economics, Sociology, Education, Journalism & Mass Communication, management, Commerce, Mathematics, Physics, Chemistry, Botany, Zoology, Computer Science & SEIP. Post Graduate Programmes: MBA; MCA; M.Tech (Computer Science) & M.Ed. UG Programmes: B.Ed and B.Tech (Computer Science). Professional Diplomas: Diploma in Elementary Education; Polytechnic-Diploma in Engineering-Civil, computer Science, Electronics & Communication, Information Technology, Mechanical, Electrical & Electronics, Apparel & Automobile. Post Graduate Programs: B.A., B.A. (Hons)-JMC, B.Com., B.Sc (Mathematics, Physics, Chemistry-MPC), B.Sc (Mathematics, Physics, Computer Science-M.PCS) and B.Sc (Life Sciences-ZBC). Bridge courses for students passed out from Madrasa for Admission in Under Graduate (B.Com/B.Sc.) and Polytechnic programmes. Bachelor of Vocational Courses: Medical Imaging Technology (MIT) & Medical Laboratory Technology (MLT). Lateral Entry: into B.Tech and Polytechnics. Part-time Diploma Programmes in Urdu, Hindi, Arabic, Persian and Islamic Studies, Tahseen-e- Ghazal & Certificate Course in Urdu. MANUU has a satellite Campus in Lucknow and Srinagar (J& K). There are Colleges of Teacher Education in Bhopal, Darbhanga, Srinagar, Aurangabad, Sambhal, Asansol, Nuh, Bidar. It runs three Polytechnic Colleges in Bengaluru, Darbhanga and Hyderabad. The University also has three ITIs in Bengaluru, Darbhanga and Hyderabad. Here is a list of programmes offered at other campuses of the university. Limited Hostel accommodation is available for the candidates. According to the rules of Government of India or GoI, there will be reservation for SC/ST/OBC/ PwD candidates into various programs. MANUU is a Central University established in 1998. It is accredited “A” Grade by National Assessment and Accreditation Council or NAAC. It is located in the city of Hyderabad, Telangana.